Networking - What can be gained from it? As I sit here trying to ignore my cravings for aubergine, rhubarb and avocado (24 weeks pregnant!) I am reflecting on the last two weeks and what a whirlwind they have been! Two particular instances have given me such a positive feel for the year ahead but on to them in a minute. Every week we receive emails inviting us to join networking groups. Often the email will state that they have a space for a gardening company and would we like to pop along to the meeting to get a taste of what they are like. Unfortunately, because of having two small children they are often at an inconvienent time. But it did make me wonder what could be gained from these meetings. Gaining work is always important but I wanted something more than that. Networking meetings won't always work for everyone. But networking can come in many forms as you will see from the two things I am about to talk about. So what are the two events that have caused me to be more open to networking? A bit of background about Ayegardening and twitter first: We joined twitter on the 1st January 2011 but it wasn't until last year that I really understood how to use it and what it was all about. My unofficial teacher in the use of twitter was Stacey from Stacey's Admin Solutions. She had some great blogs about using twitter to interact, engage others, network and build relationships. It must have worked- I have just tweeted my 11,000 tweet and we now have 3,800ish followers. Another lovely lady was Alison from the Purple Dog Network. I quickly got absorbed in the #purplebiz competition (that still runs) on twitter and through winning it our followers really took off. The followers were quality followers, not robots and I still tweet them to this day. So, moving onto #Sussexhour. If you use twitter often, you would have seen the use of hastags. You can mark a keyword in a tweet using a '#' and follow that keyword by clicking on it in someone else's tweet or using the search bar at the top. 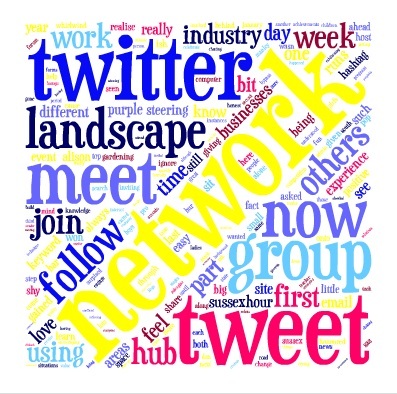 Using this keyword hashtag technique has proven useful for networking and now there are areas in the UK that will use a hashtag in a given time period to network with other businesses. This is my first time of being part of a networking hashtag and although we are only in our third week, it is so exhilarating and fun networking with other Sussex businesses. The second event that has thrilled me is being asked to be part of the steering group for the Landscape Hub, formally the pro-landscaper network. Landscape Hub is a networking site with a forum for those in the landscaping and gardening industry to meet, share news and experience. When I was asked to join the steering group (help with the day to day running of the site), I was really surpised and thought- What, little me? joining a steering group with the big boys and girls? But I am now getting to know the group and realising that we are all at different stages of our business and we all have experience and knowledge of value, in different areas, to bring to the group and to the Landscape Hub. I am so excited to be involved in such a positive network. I love learning from others in the industry, encouraging them and where I can, giving my own experiences and knowledge. Bur there you have it- two different types of networking and honoured to be a part of both. It can be easy to feel alone in this industry, or in any industry to be honest but just by sharing and chatting to others you realise that others have gone through the same situations, you can celebrate your achievements together and learn from each other too.